White kitchen designs are timeless, come in many varieties, offer a simple beauty, and can give your home a spacious feel. Whether you want a traditional kitchen design or something more contemporary white provides a neutral canvas to build on. White kitchens can make your space feel bigger and brighter, and blend with practically any home style. 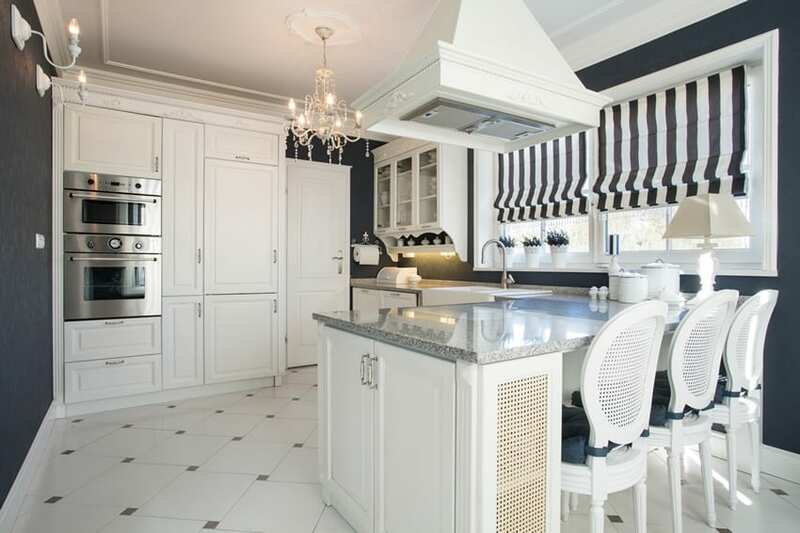 In the picture above is a classic style white kitchen which uses various tones of white to achieve this look. You can see that the walls are a very light off-white shade, while the kitchen cabinets with molding details are of antiqued white finish. For the backsplash, it uses diagonally-arranged ceramic tiles in a light beige color, and for the kitchen island, the base cabinet is Red Mahogany instead of antiqued white, making it stand-out from the rest of the kitchen. Shaker – it is the most popular door style used in the kitchen. It is designed with five-piece flat-panel that has a frame which is built from four pieces and then a single flat center panel is utilized for the fifth piece. It features clean lines with simplicity and has emphasis on utility. Flat – designed with simple flat-panel featured with hard lines as well as minimalist form making it suitable for modern and contemporary interior designs. The doors are made out from wood or laminate that comes in varied sheens and colors. Thermofoil – the doors are made with medium-density fiberboard which have been covered with plastic coating then undergone intense heat for sealing. These are featured in solid colors as well as in imitation wood grain. Inset – it projects a classy appearance which is set in the inside of the frame of the cabinet. This style typically has no exposed hinges and offers clean lines and hinges out of sight behind doors. Beadboard – the center panel are featured to appear similar with the traditional beadboard paneling. Using an all-white beadboard cabinetry makes he atmosphere of your kitchen look bright and clean. Distressed – the doors appear antique as the corners are being rubbed off or manipulated with distressing techniques to achieve the old-age feeling. Louvered – these are horizontal wood slats adding a unique style to kitchen cabinetry because of its architectural design. A lot of the louvered doors are built with spaces in between that necessitates good ventilation. Most often, these slats are used on windows, interior doors, and some furniture pieces. Custom – it allows you to have your own kitchen cabinet design according to your preferences with regards to the style whether you want to have it mixed or depending on the materials of your choice. 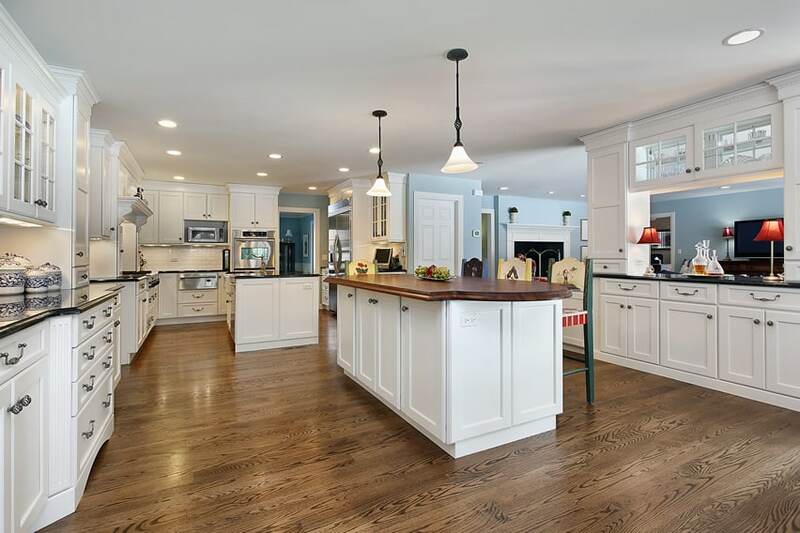 The dark Oak floors of this kitchen definitely helps make the white kitchen cabinets stand-out. 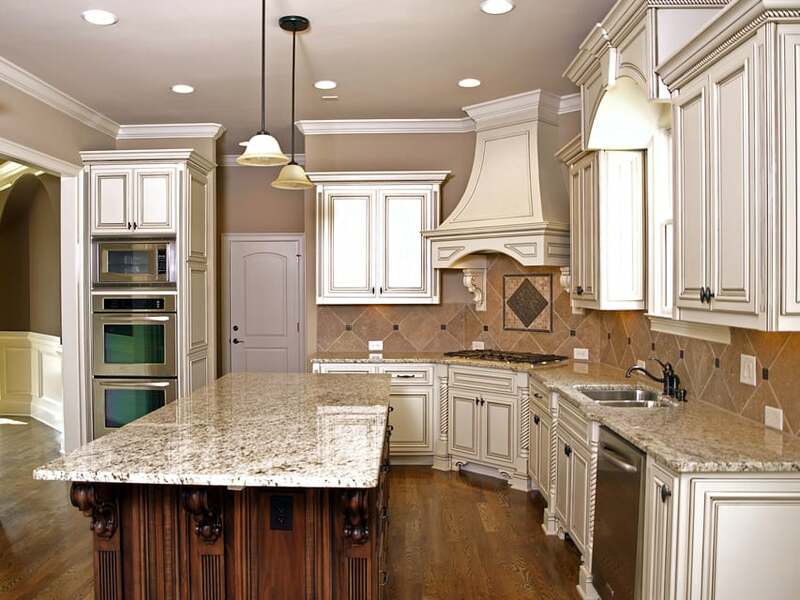 All kitchen cabinets are of antiqued white finish with molding details and topped with a gorgeous slab of beige granite. The backsplash tiles used are variously sized beige ceramic tiles which matches with the color tone of the counter top material. The walls of the kitchen are rag rolled beige, giving it a classic aged look. This is a gorgeous transitional style white kitchen which has dark walnut floors, creating a good contrast of colors between the floors and the white surfaces. The kitchen cabinets are painted in an off white color with simple molding details, and the counter top is white carrara marble. You will also see the backsplash tiles used behind the range is also carrara marble tiles. Warm walnut solid wood floors and light beige walls create a warm background for the whole kitchen, which helps soften the white surfaces. The main kitchen cabinets are in an off-white color with simple black pulls, while the large kitchen island is in a golden walnut finish and topped with gray granite counter top. Above the island are three glass pendant lights which adds to the personality of the space. 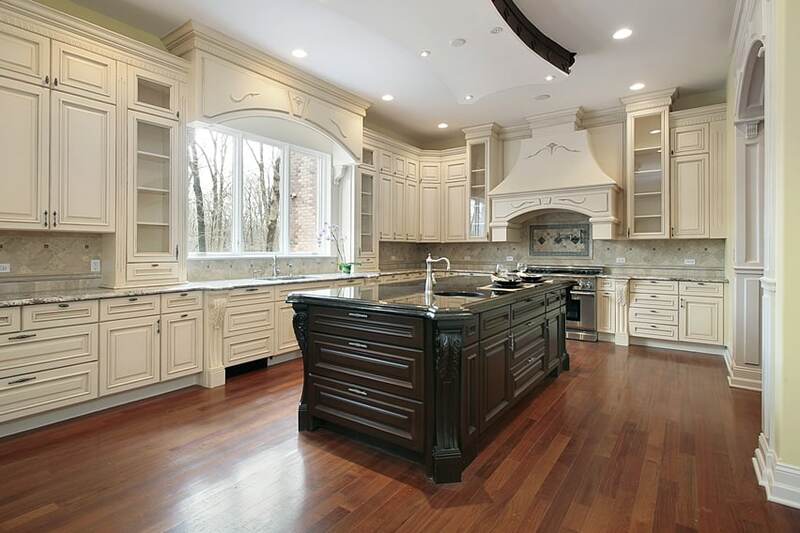 This is a large, full-sized kitchen with off-white classic cabinets in an off-white color. The floors are natural stone tiles in a similar off-white tone as the kitchen cabinets, unifying the look. There are two rectangular kitchen islands, one of which is only for additional preparation surface, while the other has installed a sink. These kitchen islands are in natural walnut finish, but uses the same light beige granite counter top as the main cabinets. 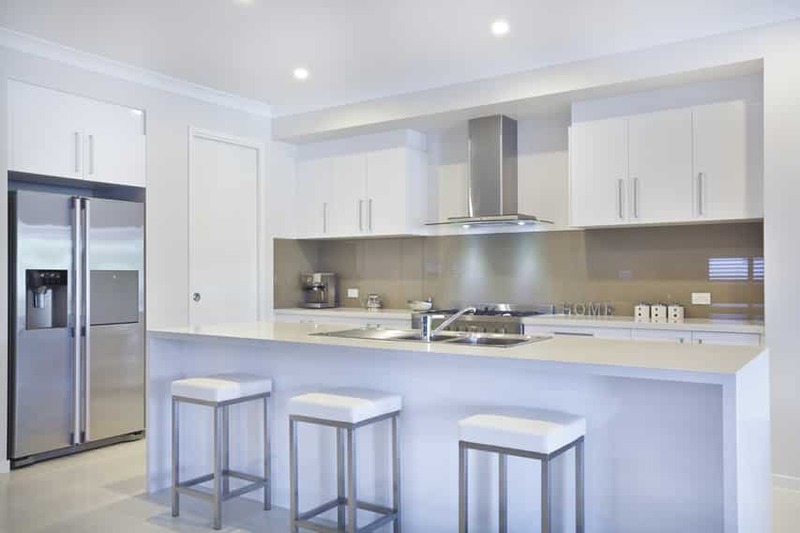 This is a small modern gallery kitchen which uses high gloss white laminates for its cabinets, combined with stainless steel appliances & hardware and white solid surface counter top for that ultra modern look. The use of aqua graphicote backsplash gives a nice pop of color to the kitchen while still maintaining its glossy and seamless modern style. The classic detailing of the cabinets for this kitchen give it a certain elegance brought about by the intricate moldings. 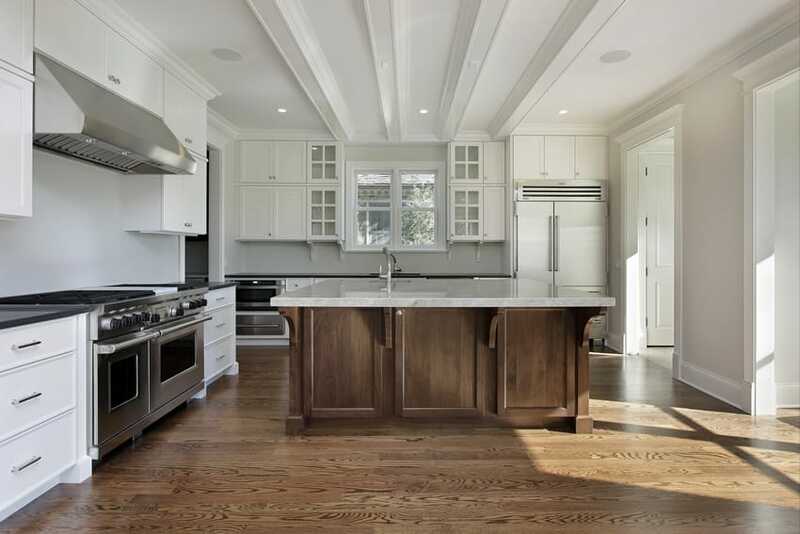 The entire kitchen is set on a warm background, mostly credited to the Red Mahogany engineered wood floors. 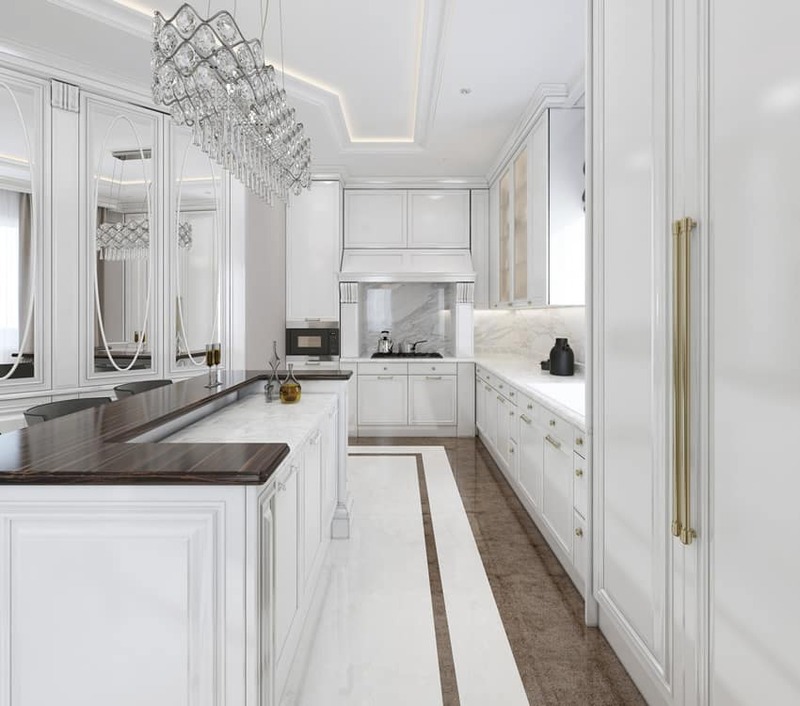 Walls are simply painted in white, but the cabinets uses an off-white color. Despite using the same style of cabinets, the kitchen island in the middle used a darker wengue finish instead of off-white, contrasting it from the rest of the kitchen. It also uses a darker black granite counter as opposed to the gray salt and pepper counter on the main cabinets. This kitchen uses a simple version of classic kitchen cabinets, with a simpler molding detail and not too much carving details. The cabinets are off-white in color with a matching light beige granite counter top and complementing stone back splash. Walls are in a light cream color which also matches the light cream shade of the floor, creating a light and warm background for the whole kitchen. 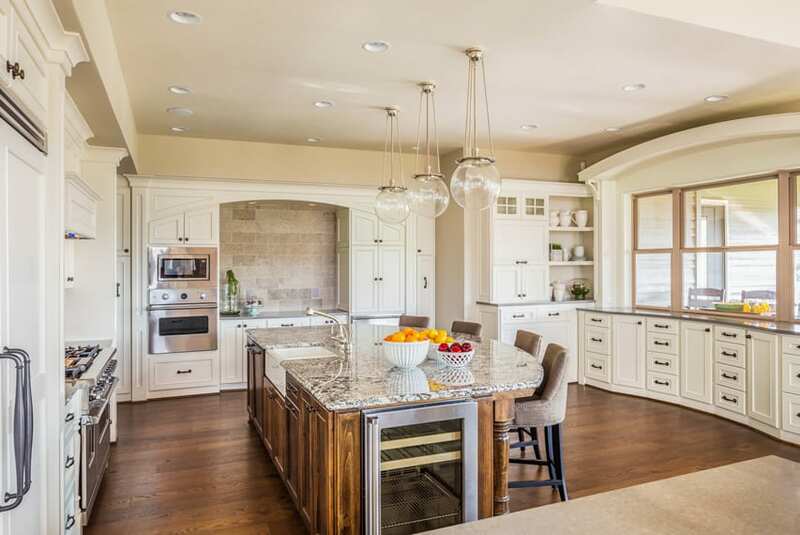 At the center, you will see a rectangular kitchen island which is mostly for additional storage and prep area as it doesn’t have sinks or stoves on it. With a gorgeous combination of simple cabinets and finishes, this kitchen gives a sleek and elegant look without looking too classic or dated. Cabinet detailing is simple and minimal, with modernized versions of molded cabinets in both white and Red Mahogany finish (for the center island). The white cabinets are combined with full gray counter top, giving it a modern look, while the mahogany island uses a light beige granite counter top to counter the dark wood base. Walls and floors are nice neutral colors of Walnut and beige so that it won’t compete with the other finishes of the kitchen. 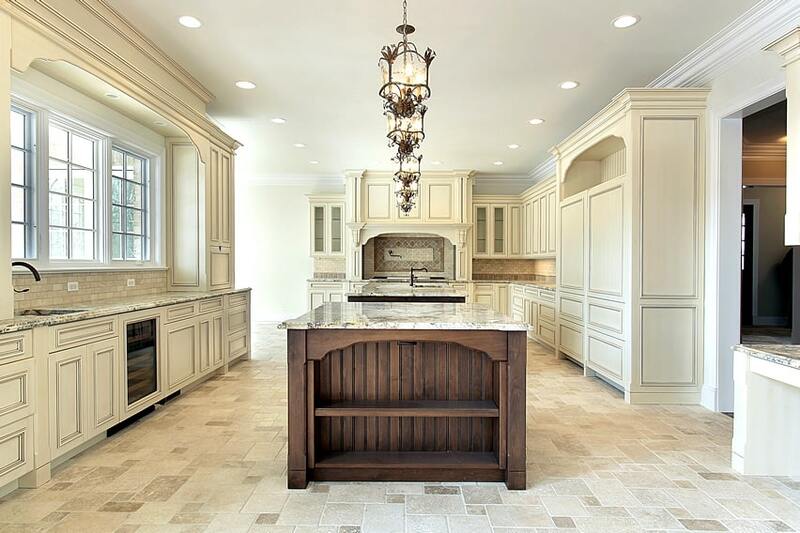 This is another classic kitchen design, with simple paneled kitchen cabinet doors in an off-white color paired with beige granite counter top to match. 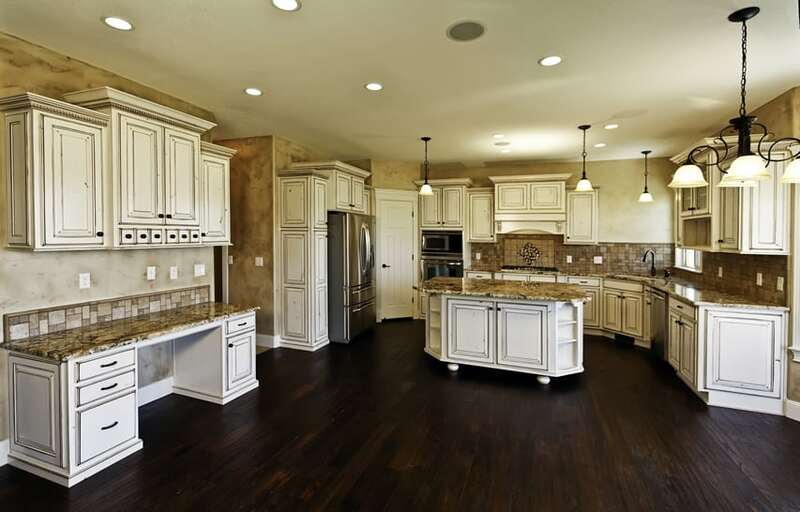 It has a large rectangular kitchen island in a dark mahogany finish. 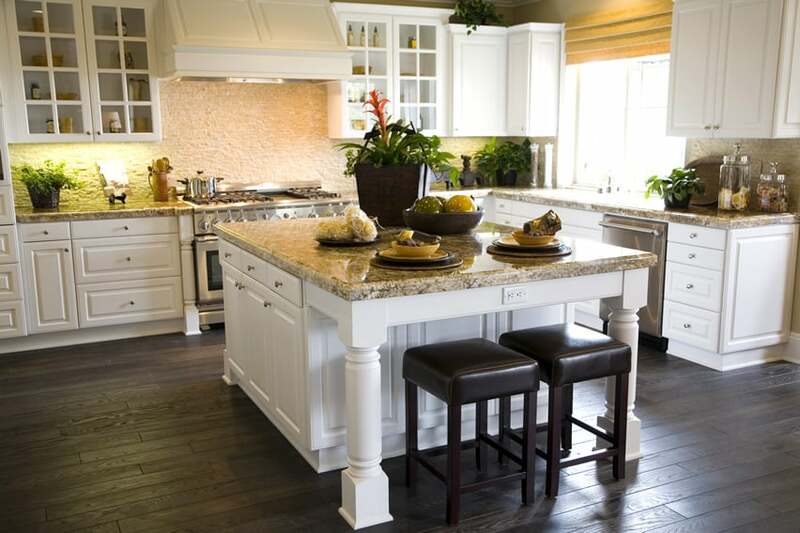 This island counter has lots of storage and also has a raised counter for dining. A transitional style kitchen which combines simple paneled cabinet doors for the base cabinets and French cabinets for the upper cabinet doors. All of the cabinets are in white finish which matches the moldings and doors used in the house. The floors are Golden Oak engineered wood floors giving the kitchen a nice warm glow. Backsplash tiles are white subway tiles, the main counter top is in black granite, and the kitchen island uses dark wood counter top. This kitchen is of simple transitional style, with simplified cabinets in an off-white finish. It is fairly large with a combination of plan and French cabinet doors. 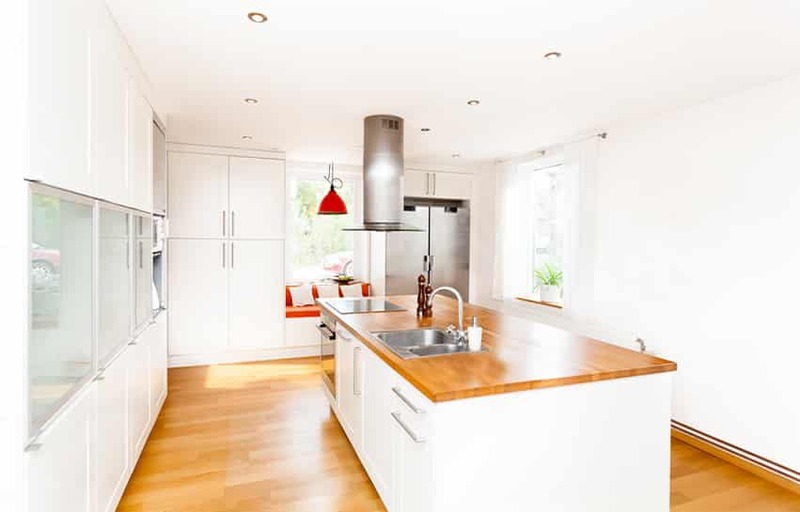 It has one kitchen island with wood counter top and also has a small informal dining area. 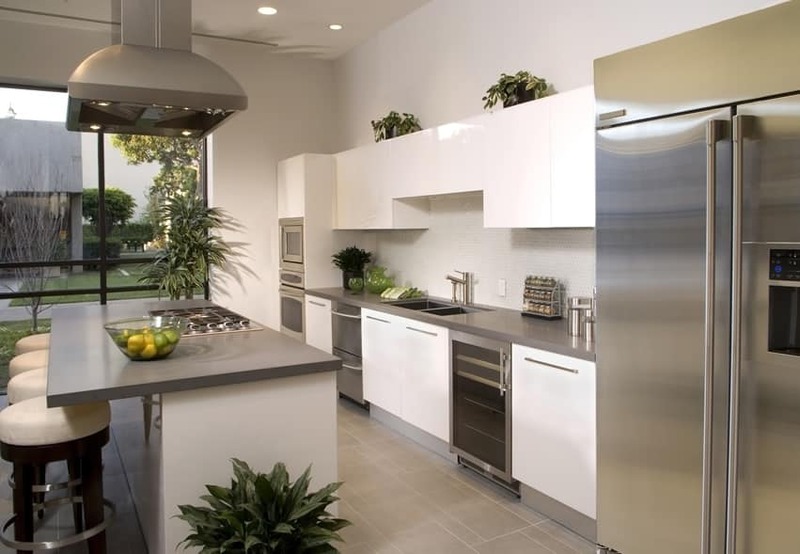 A refreshingly modern kitchen design with minimalist kitchen cabinets with mirror finish white laminates. To match the modern look, gray solid surface counter top was used, including the island counter. The walls has light cream tiles, and you will also see a full wall with cabinets and ovens on the left side. This is transitional style l-shape kitchen design uses trendy Golden drawers pulls and knobs, giving it a very sophisticated look. White Carrara marble was used for the main counter tops, as well as the back splash to give it a clean, seamless look. For the center island, you can see two counter heights, the higher of which uses solid wood with special treatment to make it more non-porous and withstand constant exposure to moisture. This also adds an interesting finish to the otherwise all-white space. This is a good example of a well-simplified transitional kitchen design. By the use of simplified panel doors, it creates a certain texture and layer to the kitchen space without being too heavy-looking as is typical of classic style kitchens. The classic elegance and simplicity of modern design are blended well to achieve this look. 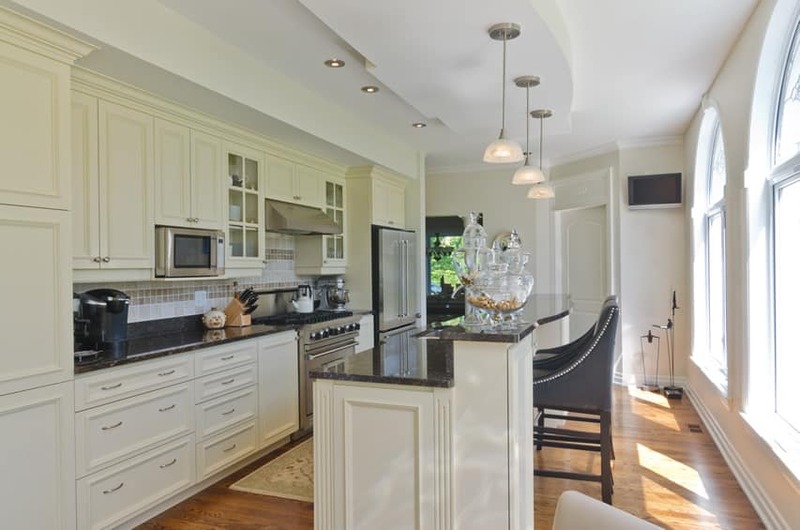 For this example, the main cabinets are all in white with black granite counters, and in the middle, there’s a large Oak-laminated kitchen island topped with marble counter top. 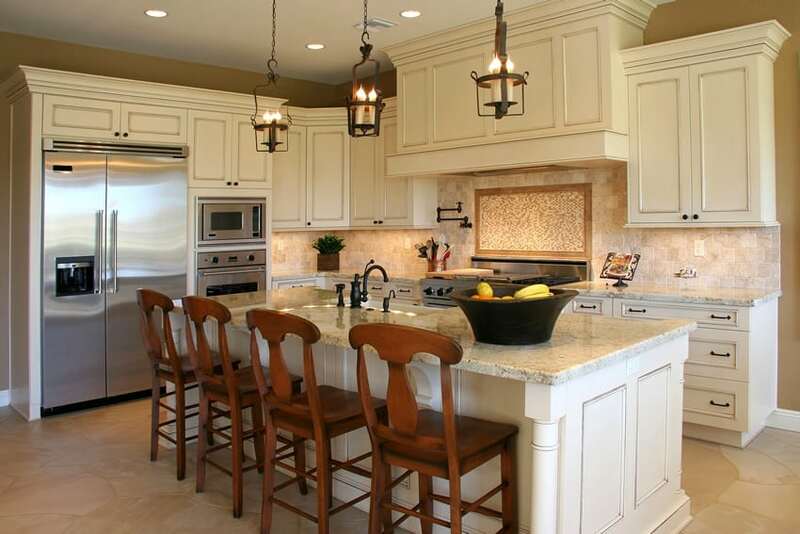 This design features a beautiful kitchen with white cabinets and granite countertops. The wengue-toned wood flooring of this kitchen gives a dark background and therefore helping the white cabinets pop out more. 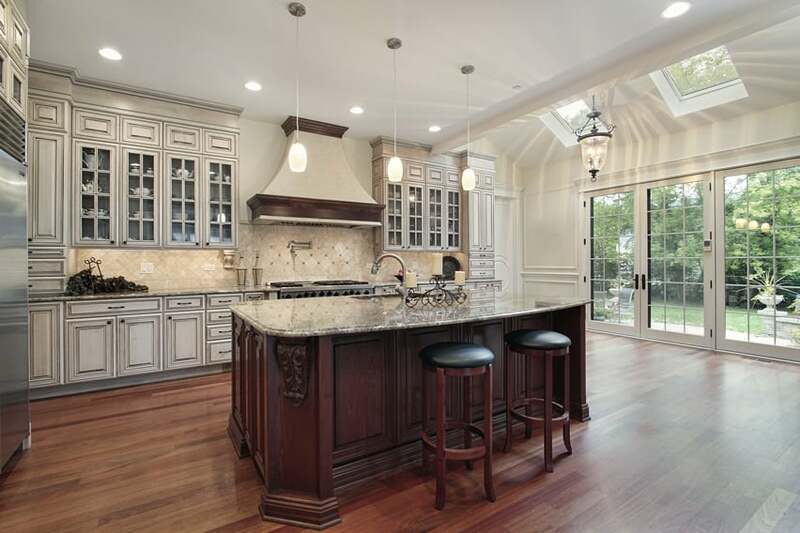 The kitchen used modular cabinetry with classic style doors, like paneled doors and French doors with clear glass. It uses a thick slab of beige granite for a simple soft look, and for its backsplash, it used a highly textured white ceramic tiles, giving it a stucco-like finish. The modern architecture of the space calls for an equally-modern style kitchen. This kitchen uses minimalist modular kitchen cabinets, which are all laminated in white with stainless steel pulls/handles. The countertop material used is white solid-surface, creating a very modern minimalist kitchen space. There’s also a full wall for pantry storage area and an oven wall on the side opposite the counter with sink. Despite the all-white configuration, the maple wood floors still manages to add a touch of warmth to the space. 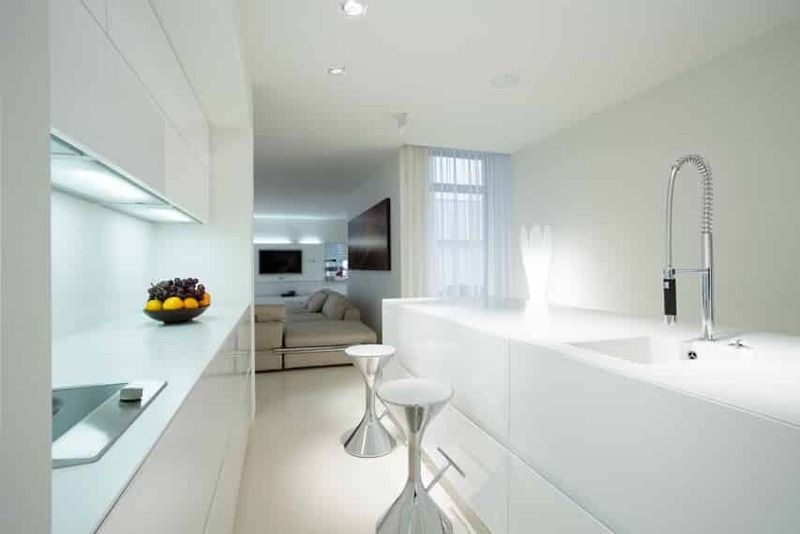 This is another all-white minimalist modern kitchen, which uses white almost all throughout the space. 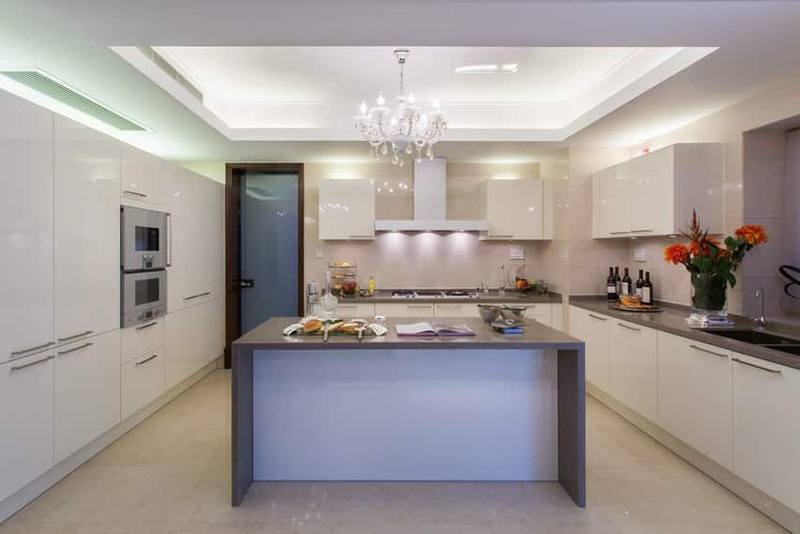 Floors are plain white ceramic tiles, cabinets are modular and laminated in white, counter top material is white solid surface, and all appliances and hardware are in stainless steel. The walls, which are painted in a very light off-white color, manages to break monotonous white tones, adding a hint of subdued warmer color into the space. This kitchen is fairly small, but the open plan layout of this home enables the space to still look large despite its limited space. Cabinets and drawers are all flushed type with a simple panel detail. 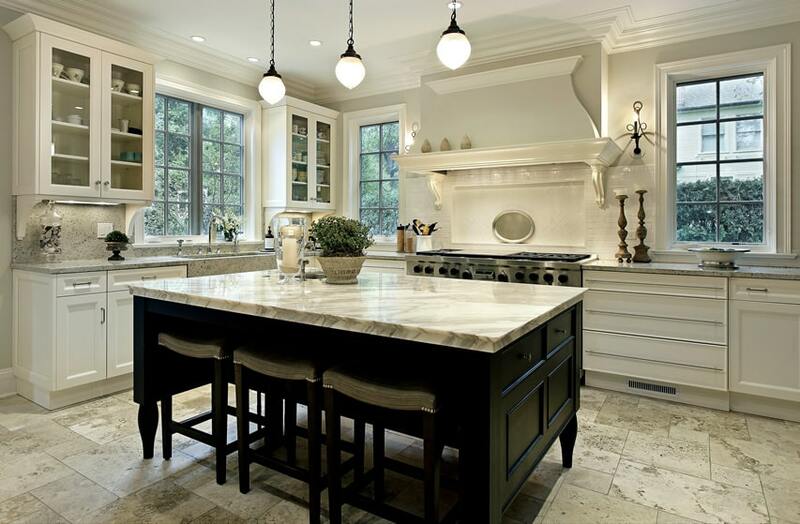 All counter tops, including the kitchen island’s, uses white marble to add to the sophisticated look of the space. The white glass subway backsplash tiles on the other hand, adds a touch of modern look to the space. 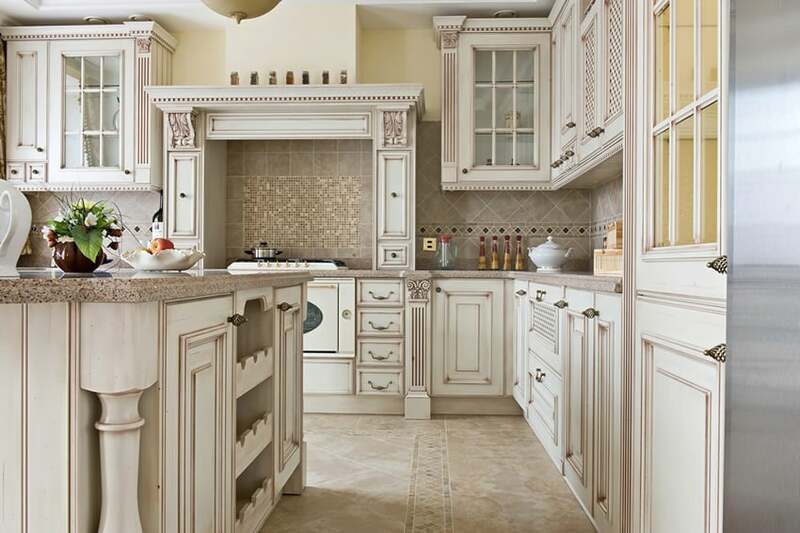 This is one of those classic style kitchens whose beauty lies in its aged look. You will see the detailed paneling on the cabinet doors, carved column details and other classic elements integrated into the design. Aside from that, instead of plain flat white, it uses antiqued white finish to give the cabinets that classic aged appeal. To match, beige granite was used for the countertop and matching beige ceramic tiles for the backsplash walls. You will also see the use of modern metal mosaic tiles on the backsplash wall of the cook top. 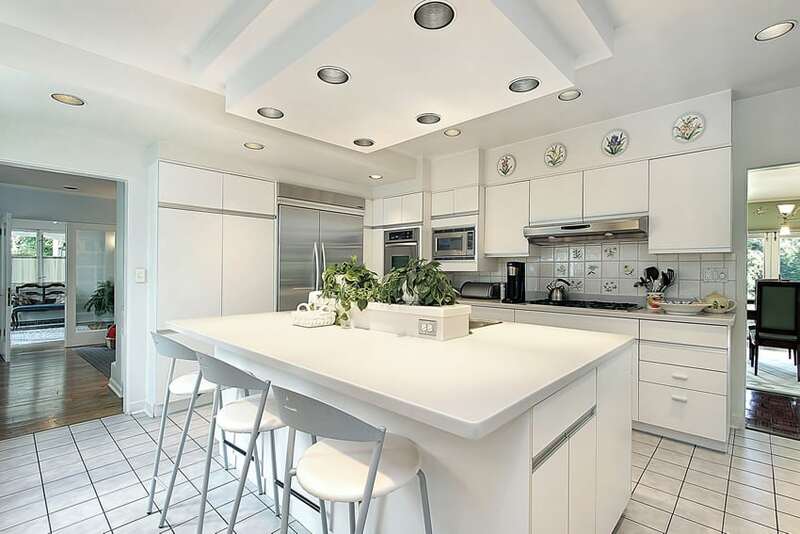 Despite using classic-style kitchen cabinets, this kitchen design manages to look and feel updated as it uses high gloss finish for the white cabinets. There’s a large rectangular kitchen island with dark wengue finish base and white marble counter top matching the one used on the main kitchen counters. 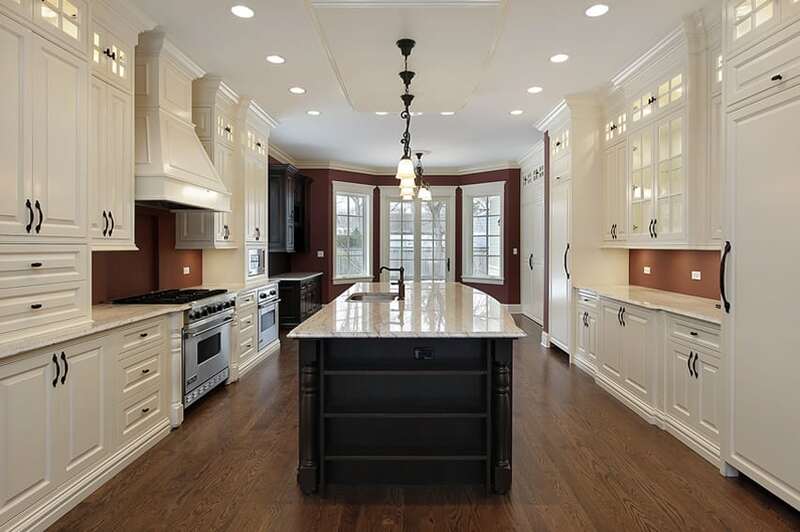 The floors are solid Walnut, and the walls, including the backsplash, is simply painted in a sienna brown color. 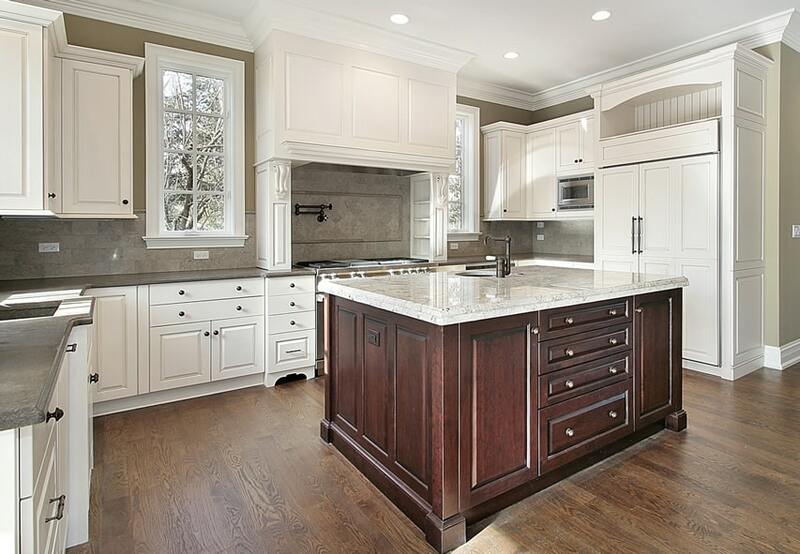 This kitchen has a warmer look, thanks to the use of beige paint and light cream cabinets instead of flat white. You can see that the walls are painted in a warm beige tone, and the simple paneled kitchen cabinets opts for a more cream-toned white, making it look warmer. The granite countertop used also has a light yellow tone to match, and the backsplash tiles used has a light peach/orange tone and has a natural texture , giving more depth to the space. This kitchen effectively combines modular cabinets with classic style cabinet doors giving the kitchen a timeless appeal. Walls are of a nice light oatmeal color and floors are natural stone, giving the space a subdued warm look. The cabinets are in white, topped with gray salt and pepper counter with white subway tile backsplash for the cooking area. The large island counter uses a thick slab of marble on top of its ebony-stained cabinet base. 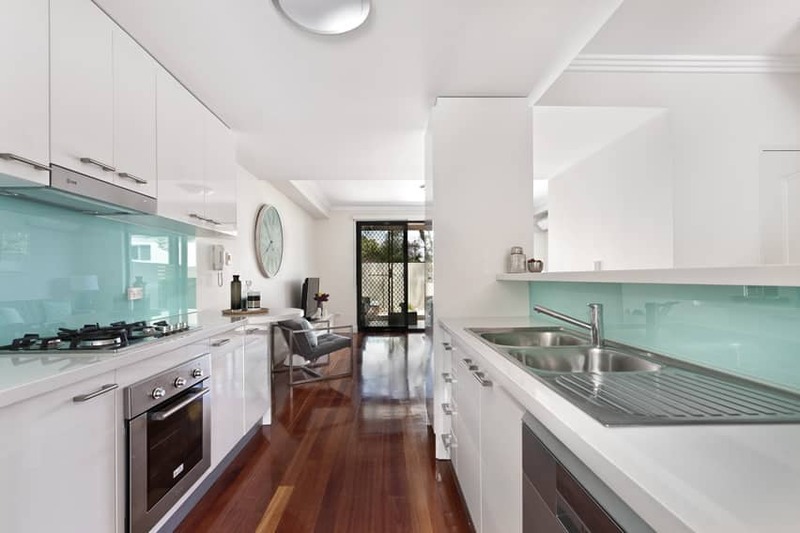 Most modern minimalist style kitchens opt for the all-white scheme to create a bright and light kitchen space, and this kitchen is a good example of such. Modular kitchen cabinets are laminated in a simple matte white color and uses concealed hinges and stainless steel handles and appliances, while the counter top material is white solid surface for that seamless white surface. In this kitchen you will see that to add a little bit of color to the space, the kitchen used brown graphicote glass for the backsplash and a very subdued warm gray for the wall color. The dark walnut flooring of this kitchen spaces serves as a nice contrast to the all-white classic kitchen cabinets in this kitchen space. This design is simple – using white paneled cabinets with white granite counter top, white sink basin and stainless steel finish for the faucets, hardware and appliances. White glass subway tiles were used for the backsplash, giving it a nice reflective surface which also adds a slight modern touch to the design of the space. White kitchens can sometimes be too dull for some people’s tastes, but this example shows how you can subtly spice up your minimalist white kitchen. The large windows provides a good vista of the garden area which helps add natural colors into the space, so even if the cabinets are plain white with gray counter top, the greens and blues of the outdoors are somehow integrated into the overall color of the space. The use of indoor plants also aids into adding a pop of color into the space without really moving away from the all-white color scheme of the kitchen. This kitchen design shows a really interesting nautical-inspired look. The small kitchen space manages to maximize storage by using a full-height cabinet for the storage/pantry and oven wall. The cabinets have simple paneling detail and are all in white, topped with gray salt & pepper granite. The dark blue walls adds contrast to the space, and this dark blue color is repeated on the striped roman blinds and the seat cushions of the chairs, giving us nice balance of blue and white typical of nautical-themed spaces. 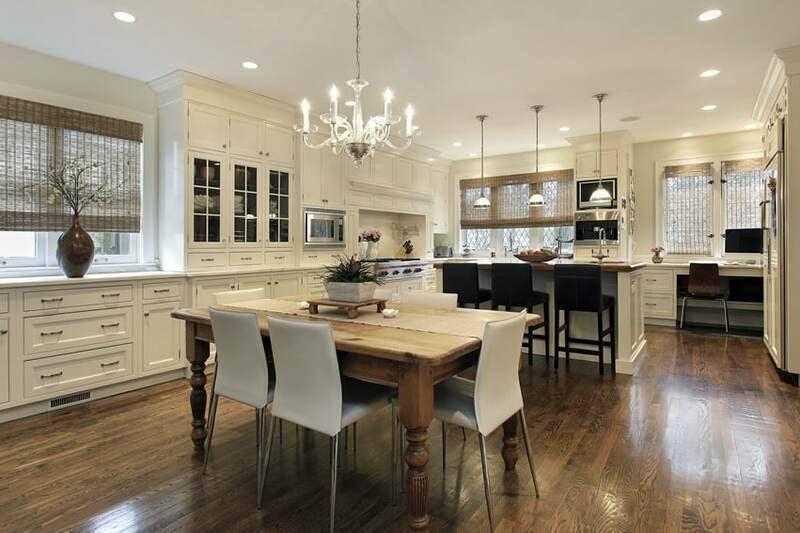 A simple classic kitchen which combines paneled cabinet doors and French cabinet doors. You will notice that instead of flat white, the cabinets are finished in a very light shade of cream/yellow. This is combined with black galaxy granite counter top to give it a nice contrast, matching the charcoal upholstery of the bar stools. The walls are white, but the floors are golden walnut, giving the space a warm homey feel. 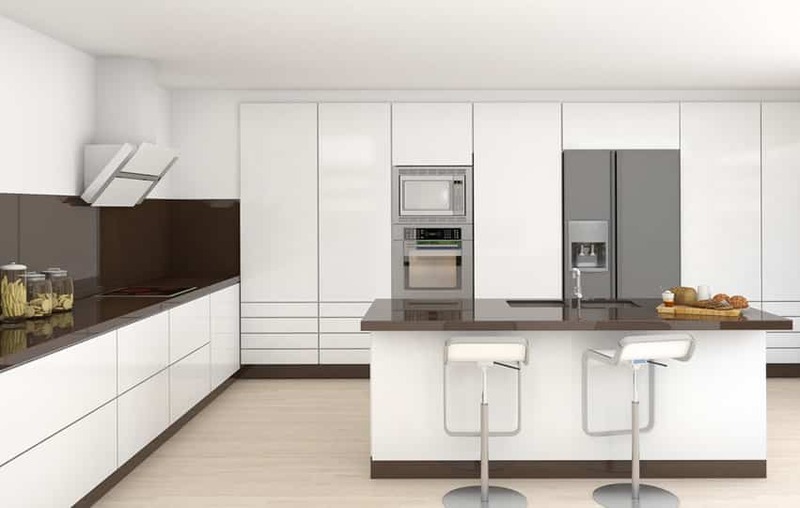 A minimalist modern kitchen which effectively combines brown and white to create a simple but well-balanced kitchen design. The floors of the space is light maple, giving the space a subtle warmth despite using flat white for both walls and ceiling. The cabinets are laminated in glossy white, using no visible hardware for that ultimate minimalist look. For its counter top, a well-polished dark brown solid surface material was used, and the same shade of brown was used to laminate the kickspace for the whole kitchen. This dark color nicely frames the white cabinets, creating a balanced look. Kitchen storage space is also maximized through a full-height cabinet on one side of the wall. Golden walnut floors and full beige walls gives set up a warmer and slightly darker background for this kitchen design. 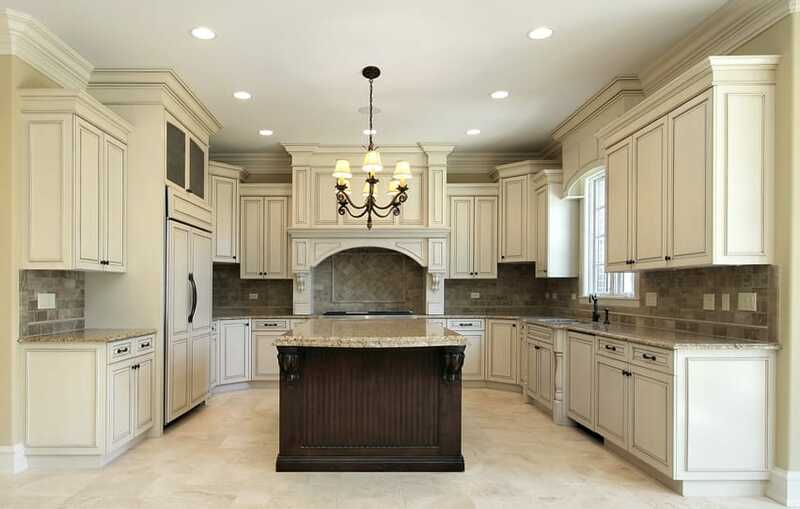 Kitchen cabinets are classic and of antiqued white finish, giving it a classic aged look. For the counter tops, a dark orange toned granite was used, and this is the same material used for the backsplash wall, adding a textured look to the wall. This kitchen also used a large beige area rug and 3 metal bar stools with light beige upholstery. This all-white minimalist kitchen has a somewhat futuristic appeal to it because of the use of lighting, adding special effects to the space. 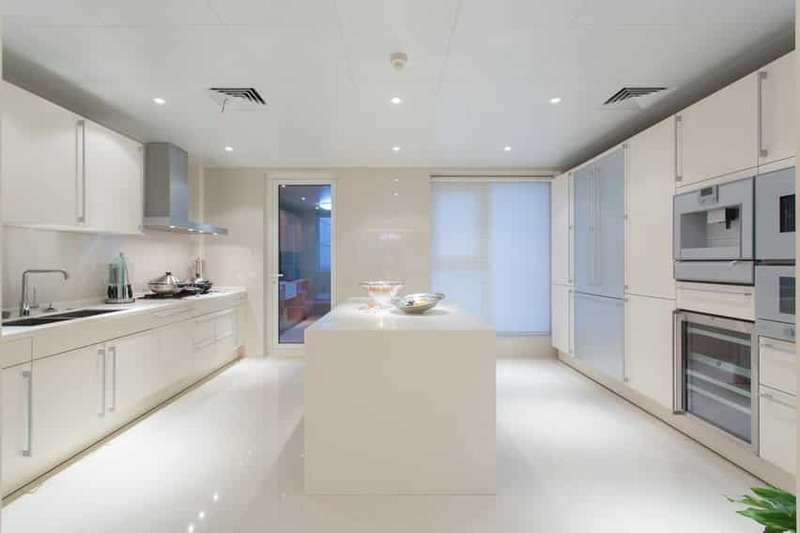 Walls, floors and ceiling are all in white, as well as the kitchen cabinets. It also uses push-to-open drawers and cabinets, creating a very seamless kitchen surface. To add to that, white solid-surface was the material of choice for the counter top, and lighting was integrated under the upper cabinets, giving a bluish sheen to the main counter space. Despite being an all-white modern kitchen, this design doesn’t have that minimalist look as it adds small elements typical of more classic kitchen styles like the tiles with flower designs for the backsplash, the plates hung on the ceiling with flower designs and the small ceramic tiles with visible grouting used on the floors. 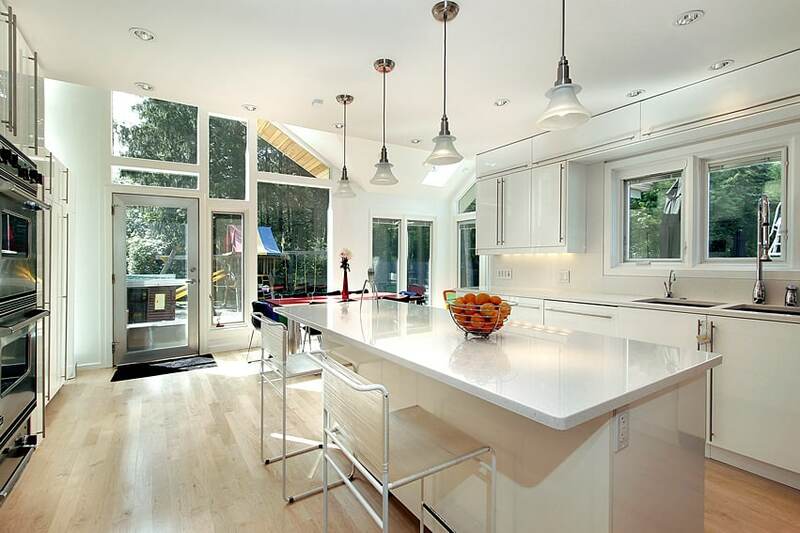 The kitchen cabinets are, however, very modern, with plain white laminated cabinets and white solid surface counter top. A modular kitchen which uses cabinets with simple paneling design combined with aluminum-framed glass cabinet doors. The result is nice and clean modern kitchen design which is combined with gorgeous solid golden walnut floors, adding warmth into the white space. The large kitchen island also uses treated solid walnut for its countertop instead of using the usual stone counters. 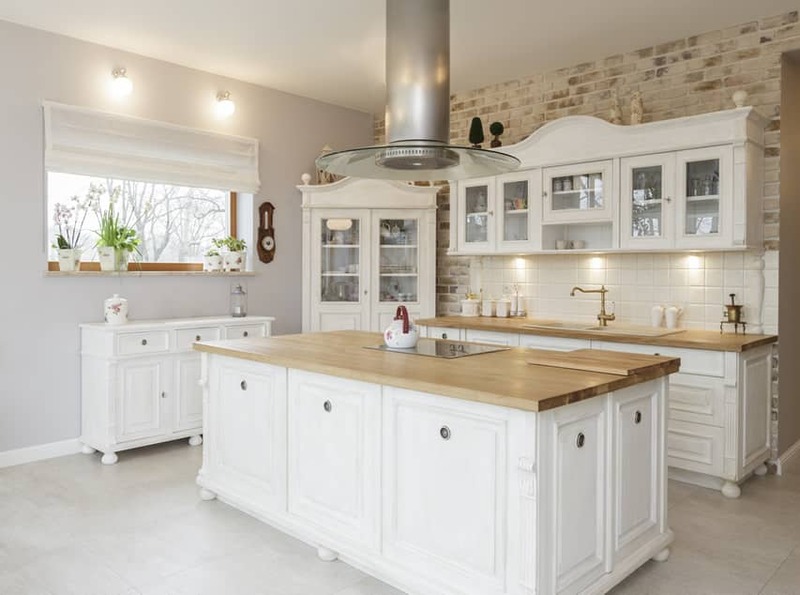 This is another traditional kitchen design which has a darker over-all look as it uses dark beige paint for its walls, combined with dark oak floors. While most of the paneled kitchen cabinets are in an antiqued white finish, the surfaces are primarily dark, even the backsplash which uses natural stone tiles in a color very similar to the wall. 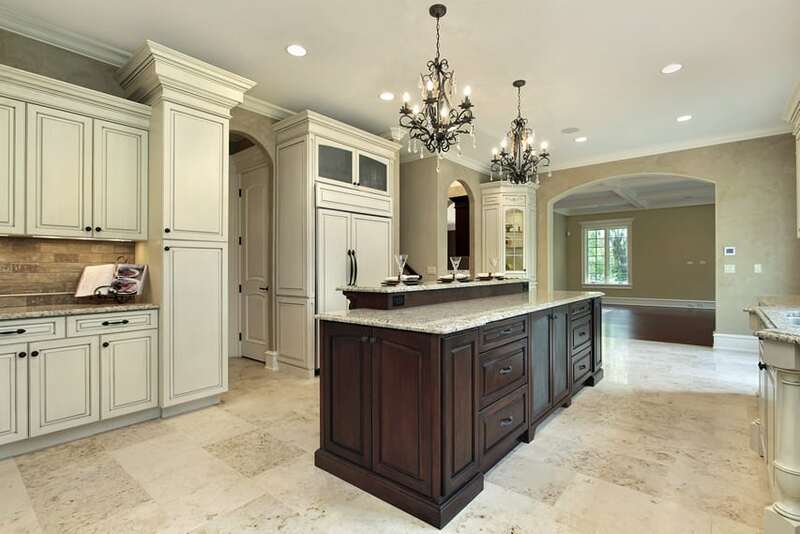 The counter top material is white granite with beige grains, and kitchen island uses mahogany finish instead of antique white, contrasting it from the rest of the kitchen cabinets. 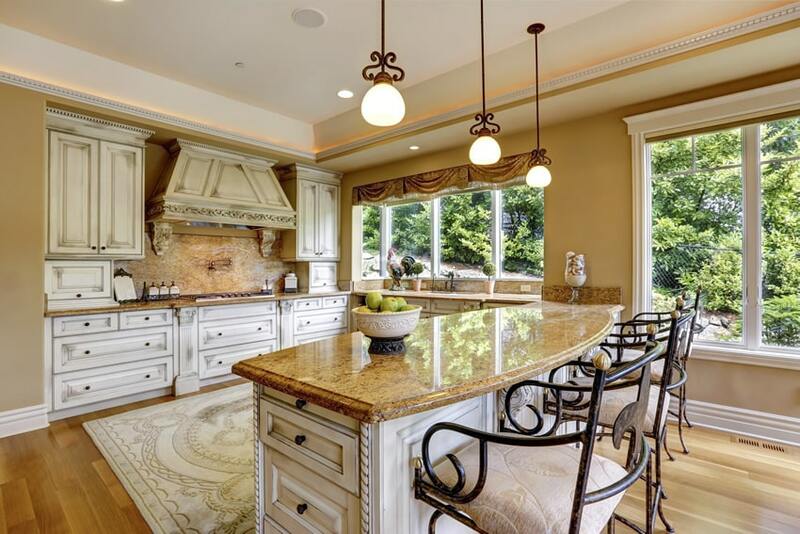 Adequate lighting is always a pleasing addition into any space, just like in this kitchen. This transitional kitchen features a lovely combination of warm and cool colors, creating a very homey kitchen space. Floors are warm gray and walls are of cool gray paint, while the paneled kitchen cabinets are in simple white, with solid maple wood counter top, creating a warm and natural counter top surface. One wall also has brick finish, adding texture into the space. Aside from the kitchen cabinets, you will also see a china cabinet and a small buffet table, all in white, with hardware matching the main kitchen cabinets. A large kitchen island with cooktop provides extra space for meal preparation and the wood surfaces provide a lovely contrast to the white cabinetry. Visit this gallery page for more kitchen island ideas.